Woodford Reserve has announced the launch of a new white corn bourbon, inspired by the craftsmanship and vision of past distillers Oscar Pepper and James Crow and their original use of white corn in their whiskey production process from the late-1830s to the 1850s. 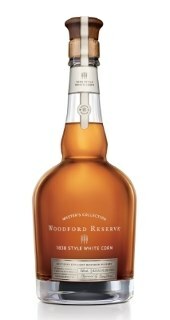 Woodford Reserve Master’s Collection 1838 Style White Corn Bourbon (45.2% ABV) uses the same barrels and yeast that are used to create their standard core expression, but uses white corn instead of the traditional yellow corn in its mash bill, along with rye and malt which help to create a sharper whiskey. In the mid-1800s, Oscar Pepper and James Crow engaged in early distilling at the current site of the Woodford Reserve Distillery. Their key production methods have since been recognized by historians as advancing the modern bourbon industry and are celebrated through each Woodford Reserve Master’s Collection release. The latest limited release was conceptualized and created by Woodford Reserve Master Distiller Chris Morris. Drawing from original production records, he was able to develop and bring to life a recipe Pepper and Crow might have used.